As a resident of Florida, you and your family have access to a statewide Prescription Assistance Program (PAP). Create and print your FREEdiscount prescription drug card coupon below. 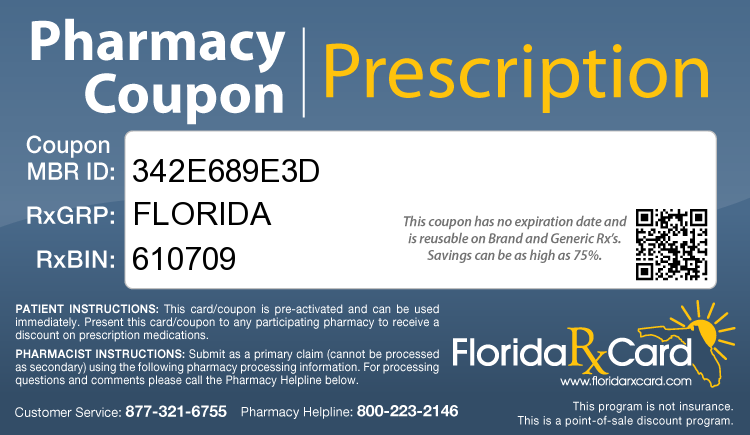 This pharmacy coupon card will provide you with Rx medication savings of up to 75% at more than 68,000 pharmacies across the country including CVS/pharmacy, Walgreens, Walmart, Kmart, Albertsons, Kroger, and many more. You can create as many coupons as you need. We encourage you to create and send to friends and family members via one of the many available options. This Coupon/Card is pre-activated and can be used immediately! This program has LOWEST PRICE LOGIC to guarantee that you get the best deal on your prescription (you pay the lower of a discount off Average Wholesale Price-AWP, discont MAC Pricing , or Pharmacy Promotional/Retail price).